As we go about our daily lives, we tend to assume that our perceptions – sights, sounds, textures, tastes – are an accurate portrayal of the real world. Sure, when we stop and think about it – or when we find ourselves fooled by a perceptual illusion – we realize with a jolt that what we perceive is never the world directly, but rather our brain’s best guess at what that world is like, a kind of internal simulation of an external reality. Still, we bank on the fact that our simulation is a reasonably decent one. If it wasn’t, wouldn’t evolution have weeded us out by now? The true reality might be forever beyond our reach, but surely our senses give us at least an inkling of what it’s really like. So while neuroscientists struggle to understand how there can be such a thing as a first-person reality, quantum physicists have to grapple with the mystery of how there can be anything but a first-person reality. In short, all roads lead back to the observer. And that’s where you can find Hoffman – straddling the boundaries, attempting a mathematical model of the observer, trying to get at the reality behind the illusion. 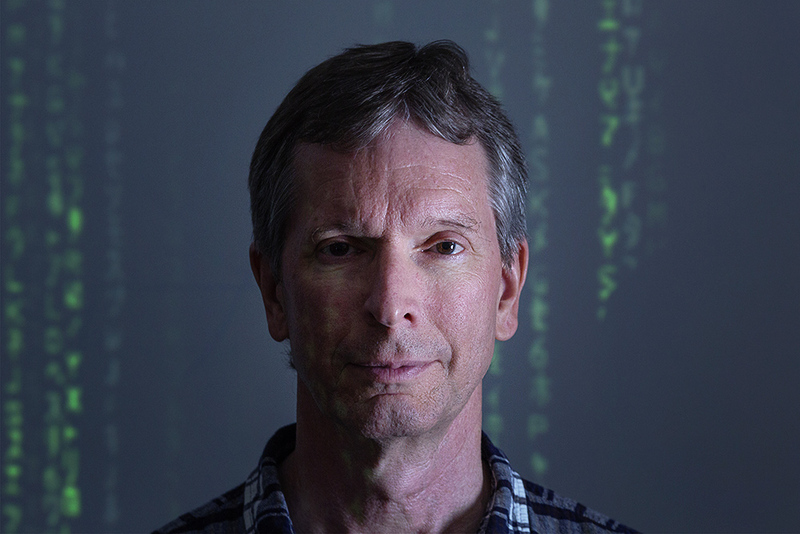 Quanta Magazine caught up with him to find out more. An edited and condensed version of the conversation follows. DONALD HOFFMAN: Right. The classic argument is that those of our ancestors who saw more accurately had a competitive advantage over those who saw less accurately and thus were more likely to pass on their genes that coded for those more accurate perceptions, so after thousands of generations we can be quite confident that we’re the offspring of those who saw accurately, and so we see accurately. That sounds very plausible. But I think it is utterly false. It misunderstands the fundamental fact about evolution, which is that it’s about fitness functions – mathematical functions that describe how well a given strategy achieves the goals of survival and reproduction. The mathematical physicist Chetan Prakash proved a theorem that I devised that says: According to evolution by natural selection, an organism that sees reality as it is will never be more fit than an organism of equal complexity that sees none of reality but is just tuned to fitness. Never. Suppose in reality there’s a resource, like water, and you can quantify how much of it there is in an objective order – very little water, medium amount of water, a lot of water. Now suppose your fitness function is linear, so a little water gives you a little fitness, medium water gives you medium fitness, and lots of water gives you lots of fitness – in that case, the organism that sees the truth about the water in the world can win, but only because the fitness function happens to align with the true structure in reality. Generically, in the real world, that will never be the case. Something much more natural is a bell curve Â – say, too little water you die of thirst, but too much water you drown, and only somewhere in between is good for survival. Now the fitness function doesn’t match the structure in the real world. And that’s enough to send truth to extinction. For example, an organism tuned to fitness might see small and large quantities of some resource as, say, red, to indicate low fitness, whereas they might see intermediate quantities as green, to indicate high fitness. Its perceptions will be tuned to fitness, but not to truth. It won’t see any distinction between small and large – it only sees red – even though such a distinction exists in reality. There’s a metaphor that’s only been available to us in the past 30 or 40 years, and that’s the desktop interface. Suppose there’s a blue rectangular icon on the lower right corner of your computer’s desktop – does that mean that the file itself is blue and rectangular and lives in the lower right corner of your computer? Of course not. But those are the only things that can be asserted about anything on the desktop – it has color, position and shape. Those are the only categories available to you, and yet none of them are true about the file itself or anything in the computer. They couldn’t possibly be true. That’s an interesting thing. You could not form a true description of the innards of the computer if your entire view of reality was confined to the desktop. And yet the desktop is useful. That blue rectangular icon guides my behavior, and it hides a complex reality that I don’t need to know. That’s the key idea. Evolution has shaped us with perceptions that allow us to survive. They guide adaptive behaviors. But part of that involves hiding from us the stuff we don’t need to know. And that’s pretty much all of reality, whatever reality might be. If you had to spend all that time figuring it out, the tiger would eat you. As a teenager, I was very interested in the question “Are we machines?” My reading of the science suggested that we are. But my dad was a minister, and at church they were saying we’re not. So I decided I needed to figure it out for myself. It’s sort of an important personal question – if I’m a machine, I would like to find that out! And if I’m not, I’d like to know, what is that special magic beyond the machine? So eventually in the 1980s I went to the artificial intelligence lab at MIT and worked on machine perception. The field of vision research was enjoying a newfound success in developing mathematical models for specific visual abilities. I noticed that they seemed to share a common mathematical structure, so I thought it might be possible to write down a formal structure for observation that encompassed all of them, perhaps all possible modes of observation. I was inspired in part by Alan Turing. When he invented the Turing machine, he was trying to come up with a notion of computation, and instead of putting bells and whistles on it, he said, Let’s get the simplest, most pared down mathematical description that could possibly work. And that simple formalism is the foundation for the science of computation. So I wondered, could I provide a similarly simple formal foundation for the science of observation? The idea that what we’re doing is measuring publicly accessible objects, the idea that objectivity results from the fact that you and I can measure the same object in the exact same situation and get the same results – it’s very clear from quantum mechanics that that idea has to go. Physics tells us that there are no public physical objects. So what’s going on? Here’s how I think about it. I can talk to you about my headache and believe that I am communicating effectively with you, because you’ve had your own headaches. The same thing is true as apples and the moon and the sun and the universe. Just like you have your own headache, you have your own moon. But I assume it’s relevantly similar to mine. That’s an assumption that could be false, but that’s the source of my communication, and that’s the best we can do in terms of public physical objects and objective science. I think that’s absolutely true. The neuroscientists are saying, “We don’t need to invoke those kind of quantum processes, we don’t need quantum wave functions collapsing inside neurons, we can just use classical physics to describe processes in the brain.” I’m emphasizing the larger lesson of quantum mechanics: Neurons, brains, space … these are just symbols we use, they’re not real. It’s not that there’s a classical brain that does some quantum magic. It’s that there’s no brain! Quantum mechanics says that classical objects – including brains – don’t exist. So this is a far more radical claim about the nature of reality and does not involve the brain pulling off some tricky quantum computation. So even Penrose hasn’t taken it far enough. But most of us, you know, we’re born realists. We’re born physicalists. This is a really, really hard one to let go of. The formal theory of conscious agents I’ve been developing is computationally universal – in that sense, it’s a machine theory. And it’s because the theory is computationally universal that I can get all of cognitive science and neural networks back out of it. Nevertheless, for now I don’t think we are machines – in part because I distinguish between the mathematical representation and the thing being represented. As a conscious realist, I am postulating conscious experiences as ontological primitives, the most basic ingredients of the world. I’m claiming that experiences are the real coin of the realm. The experiences of everyday life – my real feeling of a headache, my real taste of chocolate – that really is the ultimate nature of reality. A central precept of cognitive science is to get a complete understanding of the mind/brain needs studied at all levels. On reality, all kinds of mind control theories have been studied and developed beyond perception to a mathematic certainly as to what the majority of people will or will not do under a set of circumstances. The Control theory in sociology is the idea that two control systems–inner controls and outer controls–work against our tendencies to deviate or with the proper stimuli people will deviate. Since the 60’s, this type of maneuvering has been studied and now permeates our global environment through the media, advertising, news, politics, corporations, drugs and medicine, and even what we will or will not believe in the scientific disciplines. Effects are presented in such a way to play on our emotions, so that even an unscientific cause is accepted. Interesting article. I would argue that observers don’t necessarily have to be “conscious”. A bee observes a flower. And we, walking by, can see it too. I obviously can’t backup any of my thoughts scientifically, but I would consider it a flaw to ignore all possible observers.. even down to the microscopic level. Reality is becoming more “permanent” the more observers there are. And with satellites circling the planet 24/7, some fixed, some polar-orbiting, reality is constant;y being observed now. (in my opinion).